This trip was the first time I have ever traveled out of the country. Actually, it was only the second trip I’ve ever taken a plane to get to. So not only was I scared about flying in general, but it was quite a long plane ride to our destination. The first time I went on a plane I was going to Florida over spring break to spend some time with my family. Flying by myself was such a personal accomplishment for me so now that I was flying with other people, I was glad that I did it alone the first time. When packing for the trip, I was really unsure of what the right stuff to bring was. Even though a list was provided, I felt I needed to think about what items geared more toward my own comfort. There were a lot of clothing and items that I was going to bring but I decided against because I was scared my bag would be too heavy or that I wouldn’t use them. Turns out, I wish I wouldn’t have said no to those items because they could have been useful and I definitely could have used more clothes! I will know for next time to go with my gut and it’s better to be safe than sorry when it comes to clean socks! Going through the airport was basically the same other than I had to get my checked luggage and go through more security. What really amazed me was crossing the border into Nicaragua and crossing again back into Costa Rica. It was upsetting to learn about why there were so many people from Cuba trying to get across the border, but most likely wouldn’t be able to. It’s difficult for me to see people suffering and not be able to do anything about it. Sure, I could give them money or food, but what they really wanted was a better life and I knew that food wasn’t going to give them that. 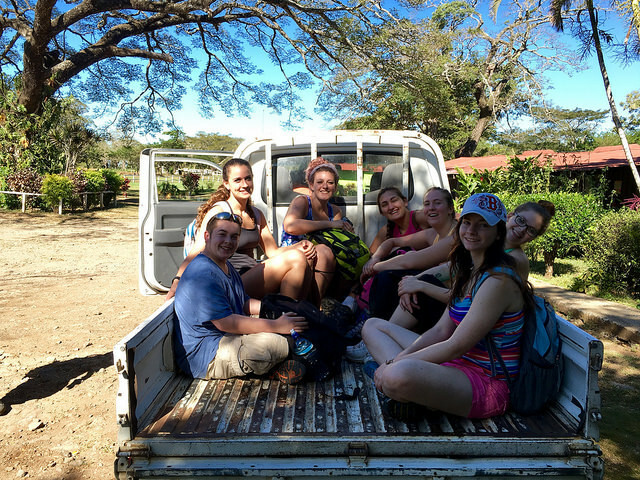 When we had some difficulty getting back into Costa Rica, I got a little taste of what it was like to have that fear of not being able to go home and not living the life I wanted to. That made me think about my future career as an Occupational Therapist and doing the best I can to help people regain strength and meaning to their lives.